Amongst the pantheon of notable public television personalities, Bob Ross easily ranks alongside the likes of Mr Rogers and Elmo as a star who is almost universally loved and respected by the public. Despite being famous the world over for his balmy, soothing demeanour, his show The Joy of Painting and his amazing ‘fro, we know surprisingly little about arguably one of the best known artists in modern times. This is partially because, for some reason, nobody ever really asked Bob Ross to do any interviews and he only gave a handful of them over the course of his life. In fact, in one of the surprisingly few quotes from the man himself that don’t come from his show, he stated “I never turn down requests for interviews. I’m just rarely asked”. However, in another interview Ross gave with Egg Magazine, who specifically sought him out because they realised nobody knew anything about him, Ross sheepishly admitted that he liked to “stay hidden” adding that he was “sort of hard to find“. In fact, Ross was so hard to find that PBS once lost track of him, though it would seem few, if anybody, noticed, until Ross called to let them know he’d moved to Orlando after the fact. As a result of Ross’ love of privacy, coupled with the apathetic attitude of interviewers back then, details about his life are notoriously hazy and difficult to nail down to the point that even the book, Happy Clouds, Happy Trees: The Bob Ross Phenomenon, chronicling his life and career was, in the end, forced to admit that their “text is… about an understanding we have of Bob Ross and his life. If we had wanted to write an accurate biographical book on Bob Ross, that goal would be difficult to accomplish“. A further hurdle for those looking to write about Ross is that his company, Bob Ross, Inc, today is fiercely protective of their intellectual property and Bob Ross’ privacy, even in death. One of the few things they’ve authorised that would come close to an “official” biography of his life is a documentary titled “Bob Ross: The Happy Painter” that can be viewed by pledging money to PBS or by tracking down a copy of the DVD, which is exactly what I had to end up doing to fill in the huge gaps of what I could find elsewhere about the elusive Bob Ross. Finally, although Ross was a notable public figure who did a lot of charity work and met with hundreds, if not thousands of people over his lifetime, he only had a handful of close friends who understandably don’t like discussing his life out of respect for his privacy. In fact, some of the only known interviews with Ross’ family and friends about him can only be found today in the documentary mentioned previously. With that out of the way, lets talk about the little we do know definitively about Bob Ross’ life and how he became the cultural icon he is today. Born in Daytona Florida in 1942, Ross was the child of a carpenter (Jack) and a waitress (Ollie) who separated, married other people, separated from those new partners and then got married to each other again all before their son had hit his teens. As a child, Ross entertained himself by caring for injured animals, much to the chagrin of his parents who soon became used to coming home to find an injured alligator in their bathtub or an armadillo running around Ross’ room. Education wise, Ross left school in the 9th grade to support himself as a carpenter with his father, during which time he lost the tip of his left index finger in an accident, an injury he later hid from viewers most of the time with his paint palette. 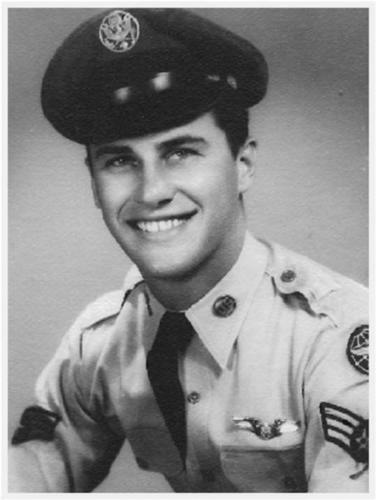 When he hit age 18, Ross joined the Air Force which saw him relocated from Florida to Alaska. the guy who makes you scrub the latrine, the guy who makes you make your bed, the guy who screams at you for being late to work. In stark contrast to the quiet, reserved nature Ross displayed on his show, in the Air Force he developed a reputation as a bit of a ball-buster, earning the nickname “Bust ’em up Bobby” from his subordinates. Eventually Ross found inspiration after watching a show called, The Magic of Oil Painting hosted by artist, Bill Alexander. Alexander touted a style of painting dating back to the 16th century called, alla prima (an Italian term meaning “first attempt”) that allowed him to churn out a painting in little under a half an hour. Alla prima is better known in the art world as “wet-on-wet” because it literally involves applying many layers of wet paint to a single canvas to create an image. During a typical episode of The Magic of Oil Painting, Alexander would create a single painting, invariably a landscape of some sort, over the course of half an hour while slowly walking the viewers at home through the entire process. Ross would later use an almost identical format for his show, The Joy of Painting, which greatly annoyed Alexander. But we’re getting ahead of ourselves. After observing Alexander’s technique and learning to use it himself, Ross began earning extra money by painting and then selling Alaskan mountainsides painted on the inside of novelty gold pans. Before long, Ross became fairly famous with locals for his talents and would often give demonstrations to children and the elderly. After a while, Ross began making more money from selling paintings and offering people art lessons than he was from his day job in the military. As a result, Ross left the Air Force after two decades of service, supposedly quipping that he’d never yell or raise his voice again. In any event, after a few months of lessons, Ross was offered a job with the Alexander Magic Art Supplies Company as a travelling tutor. While working for the company, Ross’ hypnotic, soporific voice and gentle, prodding style that emphasised that there were “no mistakes, just happy accidents” caught the attention of a lady called Annette Kowalski who later admitted that she was simply “mesmerised” by Ross’ personality. After a few lessons with Ross, Kowalski became convinced that if she could somehow “package” the experience of painting with him, she and Ross could make a fortune. After meeting with Kowalski and her husband, Ross was convinced to leave the Alexander Magic Art Supplies Company and set up his own teaching business. Kowalski was so sure of success, that she sunk her life savings into the venture with Ross and his wife making a similarly daring contribution. In its first year of operation, the business lost $20,000 (about $45,000 today). According to Kowalski, Ross’ afro was such a radical departure from his previous look that many of his old Air Force buddies watching the show only knew for sure it was him because of the missing bit of his finger. Exactly how Ross went from “perming his hair to save five dollars” to “being on TV” isn’t clear and there are two conflicting stories about how Ross came to the attention of PBS. The version recounted in the aforementioned PBS biopic of his life states that Ross filmed a commercial for the network with his former mentor, Bill Alexander, promoting his art classes that just so happened to catch the eye of the right executive. Another otherwise reputable version of the story states that Kowalski filmed one of Ross’ 30 minute lessons and sent it to the network, who liked it enough to greenlight a pilot. It’s even possible that both of these things is true. Whatever the case, it would seem Ross flawlessly executed the so called “Steve Martin” method to success- “Be so good they can’t ignore you“. Although the official Bob Ross website claims that episodes of The Joy of Painting weren’t rehearsed, this isn’t exactly true, something that becomes immediately obvious when you realise that Ross began every episode by saying exactly which colors he was going to use. Ross actually painted three copies of almost every painting ever featured on the show- a first that was painted beforehand and used for reference while filming; a second that was painted during the show itself; and a third that was painted afterwards with a photographer, allowing them to get good shots for the many painting books Ross released and sold. Speaking of which, Ross was never actually paid for appearing in the show and he never sold a single painting featured on it. The show was instead used as a vehicle to promote Ross’ teaching business, interest in which exploded after the show first aired. Over time, the business expanded to include Bob Ross branded brushes, paint, supplies, etc., all making Ross a millionaire. Most painters want recognition, especially by their peers. I achieved that a long time ago with TV. I don’t need any more. In fact, during his lifetime, Ross only ever allowed one public institution to display his work- the Minnetrista Cultural Center in Muncie. Who Really Invented the TV Dinner? Bill Alexander became very bitter towards Ross after the success of The Joy of Painting, claiming that Ross betrayed him and stole the wet-on-wet style he’d pioneered. Funny enough, Bob Ross Inc eventually trademarked the term “Bob Ross wet-on-wet” helping to make the technique synonymous with Ross. However, Ross himself openly credited Alexander as the man who showed him how to paint in his show’s first episode. 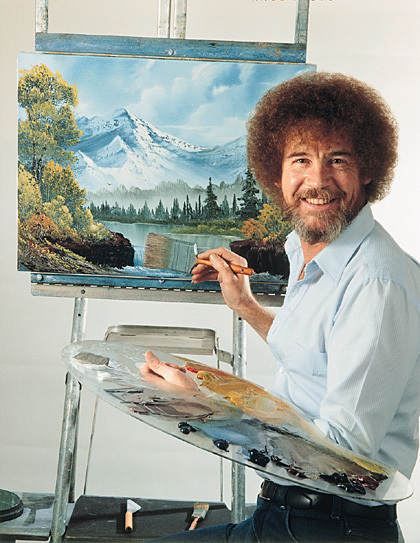 In 2014, the blog, FiveThirtyEight, performed a comprehensive statistical analysis of 381 episodes of The Joy of Painting and discovered the 91% of Ross’ paintings “included at least one tree”. ANOTHER FRAUD…THIS ROSS. 99.99% OF ALL PAINTERS AND THIS WHOLE GREAT PAINTINGS AND TECHNIQUES AND ETC ETC AND BILLION TRILLION DOLLAR ART AUCTIONS ETC R FRAUDS….IN FACT THIS WHOLE SHEBANG IS A BAG FULL OF LIES AND PSYCHOLOGICAL DEVICES……SEE GUERNICA BY PICASSO OR FOR THAT MATTER “ANY” TRILLION DOLLAR VALUED PAINTING….EVEN A CAN OF PAINT SPLASHED ON A WALL WILL GIVE A BETTER PAINTING….SO WHAT IS THIS ? I THINK THE STORY OF THE CHILD WHO SHOUTS “THE EMPEROR IS NAKED” EXPLAINS IT ALL…..SO SEE, I JUST SHOUTED….AND U ALL CAME TO YOUR SENSES. Let us guess, you’ve tried painting and failed because your “art” was no good? Don’t attack people who actually had talent. Especially when they’re no longer around. Improve your ish instead of placing the fault for your failures elsewhere. 🙂 NO DEAR…I NEVER HAD A FLING AT THIS ART EXCEPT THE COMPULSORY PART OF EDUCATION TILL 4TH OR 5TH CLASS. BUT BY ALL APPEARANCES, U SURELY SEEM A PAINTER TO ME. TOUCHY, EH! How much bitterness and self-loathing do you need to hate someone like Bob Ross. Traditional oil painters tend to dislike him, because he takes the elitism, time, and mystique out of oil painting. If anyone else can do it, I guess it just means you’re not so special babby. Also, anyone with talent can use either method. Get reckd hater. i agree. how anyone can hate on Mr Ross is beyond me. he was all about sharing and love and I love watching his shows even today.a true artist in every sense. peace. What happened to Painter Steve? Steve goes by his mother’s last name, Freeman – not his dad’s last name (Ross). His full name is Steven Andrew Freeman. He is now 44 years old (2019). He now lives in Casselberry, Florida along with his mom Lynda. He filed for bankruptcy on 12/04/16 in a Orlando, Florida; Sophia Cabacum Dean was his attorney. He also filed for bankruptcy on 4/29/05 in Orlando, Florida; Pamela J Helton was his attorney on that occasion. He currently drives a black subcompact car worth $5,000. I’m thrilled that Virgin Media over here in the UK are running a series of PBS America episodes of Bob Ross’s ‘The Joy Of Painting’. I’ve been recording them religiously and they won’t be deleted, that’s for sure. What a lovely chap and a true gentleman. Just seen one episode where he introduced his son Steve onto the programme and allowed him to take over – fantastic! A joy to listen to his calm soft tones as he explains his painting technique and as already mentioned his remark that in painting there are “no mistakes, just happy accidents”. God bless Bob Ross. I watched Bob Ross for years & enjoyed him with each show. I have several of his books, brushes & paints. I loved him & I agree with the last text that it was thrilling to see him turn the technique over to his son Steve. He was amazing & so easy going, & shared his talent with hundreds of followers. My mother use to watch a follow, Bill Alexander and I never realized that there were hard feelings between the two of them. I am sure that Bob had his bad days, especially near the end but you were never aware of it. He was always very soft spoken & gentle & I miss him. My mother always said, if you cannot say anything good about a person, don’t say anything, especially if that person isn’t around to defend themselves, & I think by some of the comments posted here that these people should shut their mouths, or at least stop typing. Say that Again. Love love. Billy the "I can see right through you" clown. I can say with 100% certainty that there are no “trillion dollar” paintings in existence. Also, typing in all capital letters doesn’t automatically make you look smarter, you completely dispelled that myth for us, thankyou. Fraud? How? He took waht he learned and ran with it. Any intelligent person does that. You hit the nail right on the head. That’s precisely what intelligent\ambitious people do when they have a family to support and need to earn a living. It doesn’t taken any talent, ambition, or intelligence to hate on someone like Bob Ross who made the most out his natural ability. Why be so bad towards someone after they have passed, even if he was alive your comment would not be morally or ethically ok because it is not fact; It’s just hateful. I understand you have an opinion but your just being a troll and trying to cause a rise. get back under the bridge, TROLL!!! When we moved into our current home, a neighbor informed me that lived down the street from Bob Ross, a great and often invisible neighbor with a constant waft of Mary Jane emanating from his house. Alas, I could not confirm the Happy Painter was a pothead, we’d moved in the year after he passed away. It’s our street’s one claim to fame. Where was this Rob??? Orlando? I maintain that he was actually Jeff Lynne the whole time. Anyone ever seen them in the same room simultaneously? Why no mention of Indiana or what he did here? Did he live in Indiana? You even mention Muncie but no state. Did he work at Ball State? My husband grew up near Muncie, in Anderson, and he swears Bob Ross used to live there. They all assumed he was gay because there was another man living with him. He also said they had a bunch of squirrels they cared for. I always assumed it was a case of mistaken identity and teased him about it, but after learning that the show was filmed in Muncie for a time, I’m not so sure! We NEED Artist Deathmatch!!! >:^| artist vs. artist!!! @Soapykitten: I’d love that show. Spend the episode showing how the artist made whatever piece of physical art and having them explain their craft, tricks, and reasoning (sort of a little edutainment). Then fans all vote at the end. Then some super awesome way of destroying the loser’s art the next episode. Like “will it blend?”, dumping it in a vat of clear acid and watching a time lapse of it dissolving to nothing, etc. Winning pieces are then auctioned off for charity and the winning artist gets some sort of nice payout as well. The winner also gets to move on to the next episode to face a new artist and to create something new each episode. What a wonderful read! Thank you very much for this. I had the pleasure of meeting and talking with Bob when I worked at a PBS station in Indiana (Bob taped his later shows in Muncie, Indiana). He was just as nice as he appeared on his shows. My biggest mistake was that I had a chance to buy one of his paintings at the stations yearly auction, but decided to give viewers a chance to buy it first. Little did I know at that time that he would soon be dead. Great article until I read where he died at 52. I just turned 51!!! Lymphoma is a SERIOUS B*TCH and it would be good cause for him to smoke reefer. The first real “television art teacher” was Jon Gnagy – a Mennonite managed to be the star of the first TV program broadcast from the Empire State Building, of all things. He also did so not for payment, but for the ability to get money from an art supplies company. Adding: His “Learn to Draw” series was cited by Andy Warhol as an inspiration, and was cited by several Caldecott Medal winners, major comic book artists and so on. a small sports car that we often saw parked in his small, circular drive. paintings. They were scattered throughout his home. My husband was also a neighbor of his in Orlando. He was just a kid at the time, but he remembered when Mr Ross readily signed autographs for him and his friends. He said he was a wonderfully friendly man who was very quiet and humble, his son was also very nice. To this day he still has a signed drawing of a mountain that he did for him. wow. that is so cool. its good to know he was that person also in real life. tending to injured animals and living the artist life. thanks so much Donna for this insight. rest in peace M r Ross. I am hooked on The joy of painting! Found it on Netflix and have been watching it on YouTube every night before falling asleep. Bob Ross has got to be the most peaceful artist of all time. I love this article, very informative! His calm personality was so mysterious to me I had to look his bio up. I’m so happy to have come across this page! Thank you! And thank you Bob Ross for inspiring me to paint again! I never fully understood nor appreciated paintings until I began watching The best of The Joy of Painting. I was instantly intrigued with Bob Ross because I was captivated by his genuine, kind, gentle loving spirit. I knew immediately he was a God-fearing man because he often reflected on the creative genius of Almighty God as he painted while televised. Besides, how can any of us who faithfully watched him on television could forget how he would end each show by saying, “God Bless, my friend”. I too am an animal lover and monthly support the HSUS (Humane Society of the United States), and can relate to Bob with his devotion to caring for animals that needed help if it meant just surviving for one more day. I discovered Bob Ross while I was residing in Illinois several years ago, however, I now reside in New York and cannot find his program anywhere. I miss his program greatly and miss Bob Ross even more as the years pass by. I’m convinced Bob is now happier than ever in Heaven and no longer suffering here on earth. We love you, Bob. You can find dozens or Bob Ross episodes on YouTube. I grew up watching Bob Ross and was always so relaxed and felt different in a good way when I watched him. Turns out he is without a doubt the king of ASMR and to this day I love watching him. His love of nature is also endearing and his love and care for animals shows just how special Bob Ross was. Someday, perhaps we will get another similar Bob Ross personality but for now Bob is the ultimate artist and naturalist. Love watching Bob Ross who I always termed , , the “happy little tree artist” and ” the “soothing- voice artist”. But what spoke to me most about Bob was his obviously live for nature & animals that ecposed itself through the paintings and at times with visits by little friends at the studio like a little a squirrel, an endearing charming thing about Bob that touched mt heart. Altough I didn’t come to learn about him until later in my life his programming always aired very early in the a.m. …but I would be sure to set my alarm clock before sunrise just to catch his show. Of course, it always ended way too quickly the way everything does when one enjoys something so much! When my father , at age 70 wanted to learn to paint, I purchased him a whole huge box filled with Bob Ross goodies for Christmas one year! I still get up each Sunday before sunrise just to watch the “happy artist”! My son loved Bob Ross’s show, “The Joy of Painting for many years. In 2008 I became a retired USAF veteran. One day I remembered that before my wonderful wife and I had kids I oil painted but could never do clouds. I bought a couple of Bob Ross DVD’s a year or two ago and thanks to his kind manner of teaching got it, after some practice. What a wonderful person. He made this world a brighter place and I think healed many hurting animals and people. God bless him. Hope to meet Him in Heaven. To answer a question above, Bob lived in Florida primarily, he did have a small house in Muncie where he would stay while taping the show. It’s interesting, he lived in Florida, filmed his show in Indiana, and painted pictures of Alaska. Bob did turn down one big interview, Oprah Winfrey wanted to have him on her show but he refused. He wanted to paint, she wanted to talk about why he and his wife didn’t live together and why they actually lived in separate states. He was also subject of rumors about his sexuality, because they lived apart and he frequently had house guests. It was thought he was gay, it was also believed and still is by many people, that he did not die of Lymphoma but in fact had AIDS. His last marriage was believed to be an entirely business arrangement, in fact it’s been rumored that Annette Kowalski set the marriage up so Bob wouldn’t be a single male artist. However, if you watch the season of the Joy of Painting when his wife died you can tell he was hurting, and even the beginning of the next season when he thanked everyone for their cards and letters of support. It was shortly after this that he was diagnosed himself. The last episode of Season 31 is rather sad, as it’s apparent he doesn’t think there will be another season. He could have loved her without having pants feelings for her though. Bob and I were close friends. His primary residence was in Muncie. He did visit Florida regularly as his mother and brother both lived in Orlando. Much has been speculated about his private life–mainly because Bob liked to keep things private, especially about his son Steve who he adored. The happy persona that folks saw on TV was pretty true to form. Does Donna’s comment mesh with your memories of him? Do you recall his brothers name or how many brothers he had? Bob was a true master in his craft. Sure anyone can paint and some could say that people that can’t even paint can still make art or at least produce a object that visually causes a person emotions. It all comes down to the end product, which threw his brush strokes, to the colors he mixed, which is so important, the hues and tones. He was a master. No matter what anyone says about Bob. Thank you for enriching my life. My first ever oil painting. Not bad. Here’s my first painting…it’s not the greatest but I did include a “happy little tree” like Bob taught me. Bob Ross and Crilley are my favorite teachers 🙂 I wish I could keep as calm of a demeanor as Bob did. Bob Ross, you just can’t tarnish this gentle man. Shut up please. Imagine if he lived another 30 years? And btw the “wet” method of painting was invented hundreds of years ago as “quick sketch” technique to determine how some of the very large and very long process of today’s iconic art would look like….so it’s not a 20th century technique. What Ross did do was invent some different colors of paint. I was hoping that they would cover the fact that he has a coke nail in a lot of his pictures. The “coke nail” he sported was used by artists for centuries as a way to quickly and easily remove excess paint without grabbing another tool. Love, love, love his painting videos. What part of Orlando did Bob live in? And where did he attend high school (before dropping out in ninth grade)? Thanks! Yeah, you really can’t dislike Bob. You can tell he’s a genuinely peaceful and I would bet, honorable, man. People bashing him here is pretty messed up. Bob Ross was a Christian and wonderful person. Park, you are one angry person and should be ashamed about what you said about Bob Ross.